Come down to the Omaha Children’s Museum this summer to experience their awesome Dinosaur Safari exhibit. Your kids are guaranteed to love the real life replicas and interactive programs. Learn a lot, make new friends, and enjoy days filled with family fun activities and events. To learn more read below! The Dinosaur Safari Exhibit features 18 dinosaurs, including 10 colorful new creatures such as a Parasaurolophus, velociraptor and an ankylosaur. They appear so lifelike, you feel as though you are staring at a piece of history! 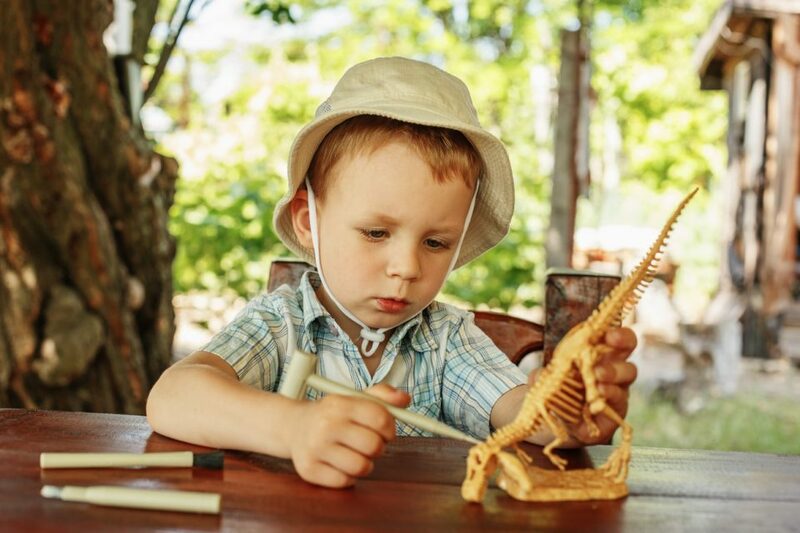 There are a ton of hands-on activities for kids including three dig tables with realistic large fossils to uncover, a kid-size safari jeep, a lookout tower, and the Mini Explorers area for children ages 3 and younger. Best of all kids are welcome to climb on some of the dinosaurs! Creature Feature – Don’t miss your chance to witness and interact with live animals and discover their individual connections to our prehistoric past. Creature Feature takes place Monday-Saturday, 10:30 a.m. and 2:45 p.m., and Sunday, 1:45 p.m.
Fossil-tastic Fun – Dinosaurs + awesomeness = Fossil-tastic Fun! Come learn, invent and dream with us! From 3-D dinosaurs to tracing fossil imprints, anything seems possible! The fossil-tastic fun takes place every Monday-Saturday, 12:45 p.m. and Sunday, 2 p.m. Make sure to stop and have some fun! Sluice Sleuth – Discover the mysteries of mining with Inspector Rock. Learn about mining as we pan for fossils, gems and more! Sluice Sleuth takes place Monday-Saturday, 11 a.m. and 2 p.m.
Safari Quest – Do you like to explore? Come go crazy at Dino Quest Safari with Dr. Terry Dactyl. We will be examining and climbing in search of dinosaurs and safari treasure. Make sure to bring your sense of adventure with you, and a smile! The Safari Quest takes place Monday-Saturday, 10:15 a.m. and 3:30 p.m., and Sunday, 11:30 a.m.
To learn more about the Omaha Children’s Museum, visit their awesome website today! Make sure to check out all their summer events, and find the perfect activities for you and your family! With so many options, there is guaranteed to be something everyone will enjoy! On your way home from your next dinosaur adventure, be sure to stop by O’Daniel Honda right here in Omaha, Nebraska! We have a huge selection of both new and used vehicles for you to choose from, and our friendly staff is always here to help! Here at O’Daniel Honda, we know community is important. That is why we have proudly served the Omaha community for years, and will continue to do so for years to come! Come in for a test drive, or visit our top-notch service center. We look forward to seeing you very soon!